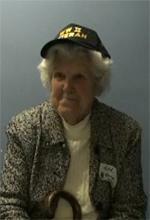 1943 Ruth signed up for the Women’s Army Corps and was sent to Arlington, Virginia and spent the entire war there. 1944 The teletypes would run 24hrs a day and sometimes they would need to be turned off to allow them to cool down. All of the teletypes were in code so the operators could not actually read them but the messages were streamed in from every campaign and then sent to decoding for actual use. 8/6/1945 Then one night all of them just stopped and could not figure out why. The reason was the atomic bomb went off and disrupted all communications.